The simple dish of brains masala is one of the single best foods to eat in Peshawar, Pakistan. The ingredients are simple, and it takes just minutes to make, but the combination and freshness, is of absolute perfection; These fried brains are just mind-blowingly good. 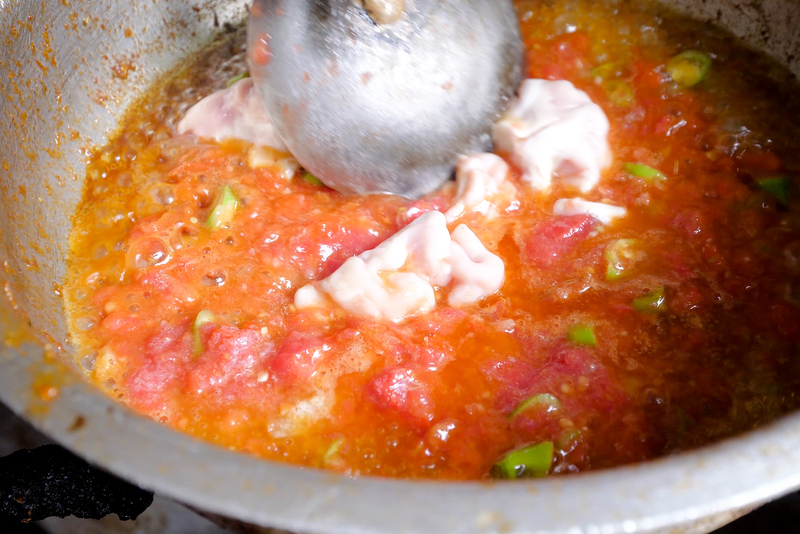 Scroll down, and I am going to share with you the photos and details of this Peshawari street-food specialty. You will be learning to enjoy a lot of food in Pakistan that involve none of the ‘normal parts‘ of any animal you might be familiar with. 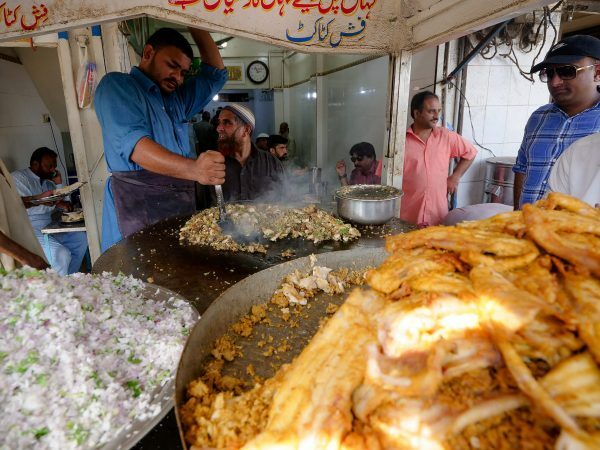 From gelatinous goat trotters in Lahore, gloriously hearty bone marrow biryani in Karachi, and the infamous organ mash-up (‘Kata-Kat’), Pakistan is doing some truly amazing things. 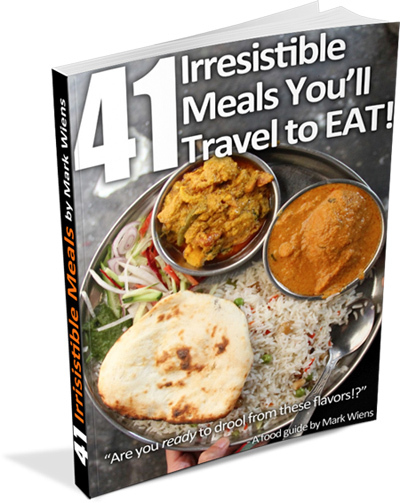 These brains easily make the list of one of my favorite single-dish items for the entire trip. This is one dish that actually has everything you could ever want for flavor, all compact and magical, in every wonderful bite. 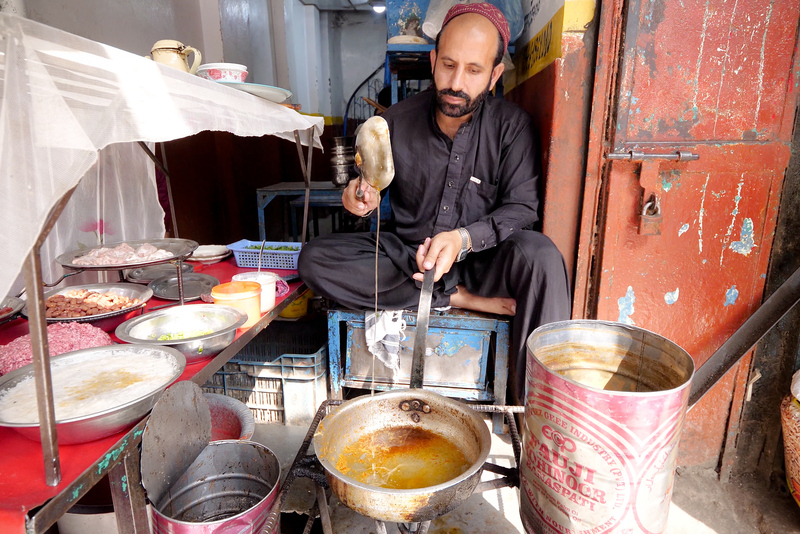 In Peshawar, Qissa Khawani Bazaar, also known as the ancient “Storytellers Bazaar,” is a market packed with history where traders and merchants used to come to drink tea, and tell stories from their travels. It also happens to be an epicenter for brains masala. Most good things begin with ghee! Completely unplanned, we were just strolling around Qissa Khawani Bazaar, when I noticed a plate of the whitish-pink, crinkly cottage-cheesy looking blobs, that could only mean fresh brains. Sitting cross-legged, a can full of ghee, a colorful assortment of seasonings and spices, laid out on his podium cooking station, there was no way we could resist his fresh brain masala. As soon as you order, he busts out the unwashed pan (still laced with flavor from the last batch), fires up the stove, and immediately drizzles in some ghee. 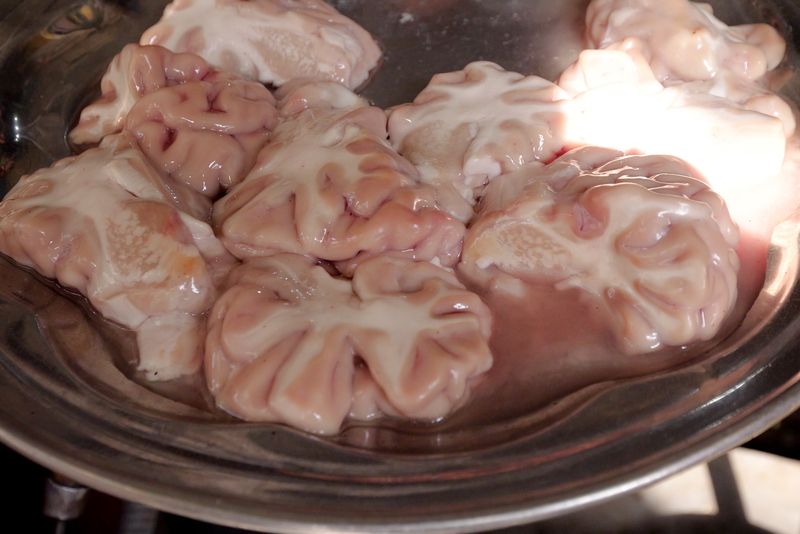 Since the fire is cranked so high, the ghee starts bubbling in seconds, and he tosses in chilies, tomato puree, and a good handful of, in this case buffalo brains. Using a metal spoon, he clanks the bottom of the pan, mashing, – making sure not to mush them, but scramble them – just like a scrambled egg. By this time, the aroma being released from the pan will hit your nostrils, and your mouth immediately starts to water. The good news is though, he fries it so fast, it only takes about 1.5 minutes for the entire process. Next, some more seasoning – masala powder, salt, chili powder, and handful of chopped coriander. Followed by a whirling stir and chop at the same time. 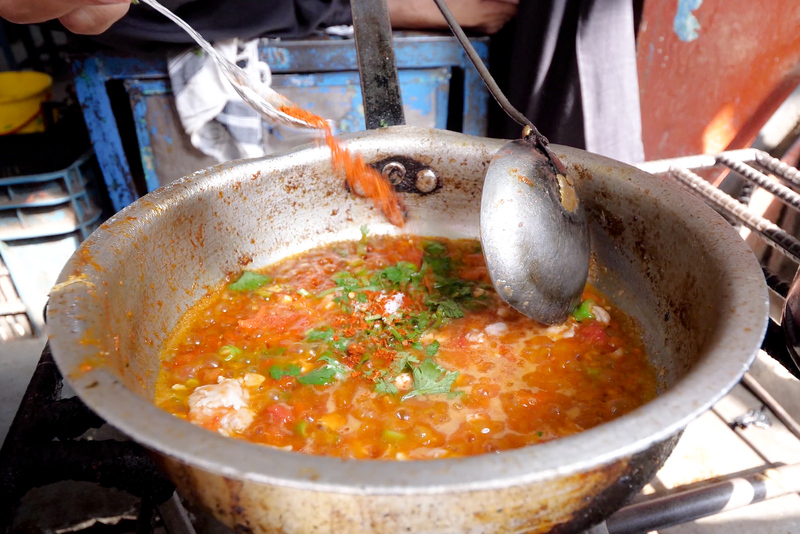 Seconds later, he turns off the gas, pours it onto a plate, and seconds after that you can be taking your first bite of instant, piping hot, fresh scrambled brains masala. Along with the brains masala came tandoori roti and a delicious chutney, which had a tangy tomato and garlicky taste. The brains were the highlight – delicate and creamy, like nuggets of cottage cheese, and melt in your mouth at the same time. 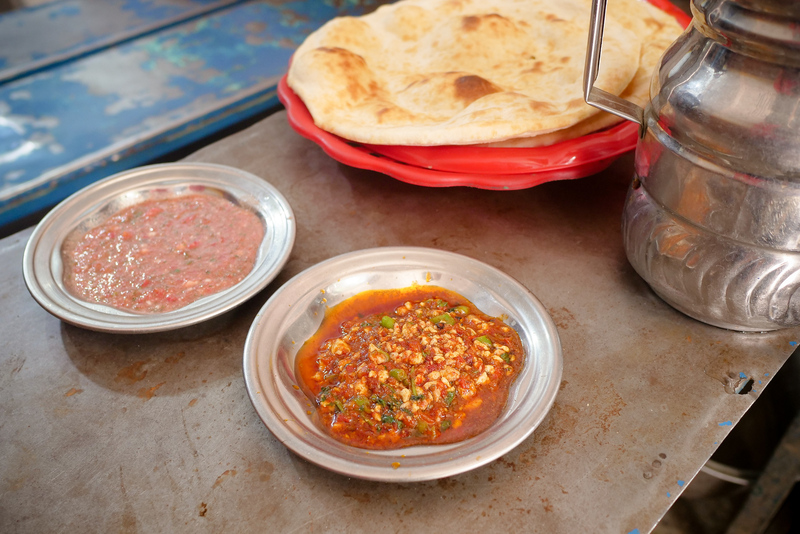 Take that extraordinary texture, and blend it with a spice-riddled tomato-based gravy, and a refreshing touch of fresh chilies and coriander, and you have a recipe for ultimate satisfaction in Peshawar. Even though it was an impromptu food stop on our full-day food tour of Peshawar, it was one of the best little unplanned snacks ever. We licked the plate clean. Something very different across Pakistan from East to West is the tea. Not only does the landscape change, but so do the people, their language, and even their after-meal preference of beverage. 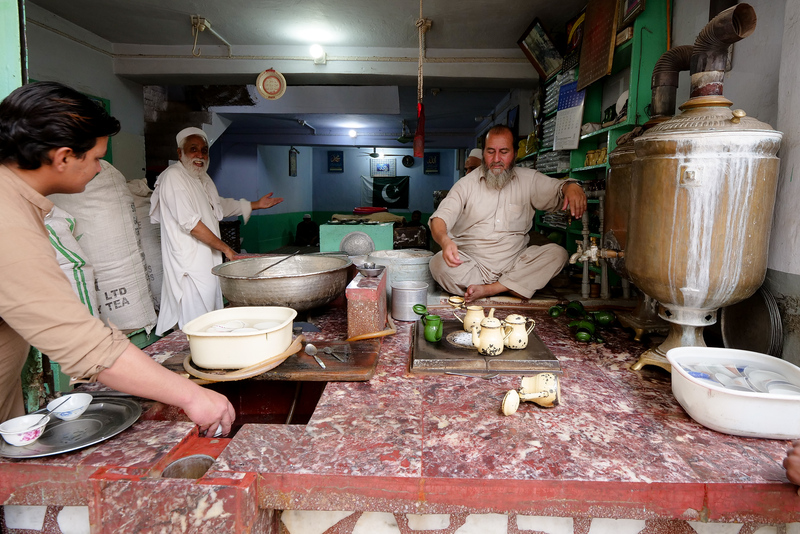 Afghan and Pashtun traditions are more common in Peshawar, and restaurants in this area serve green tea, known as kahwah, as the usual beverage. 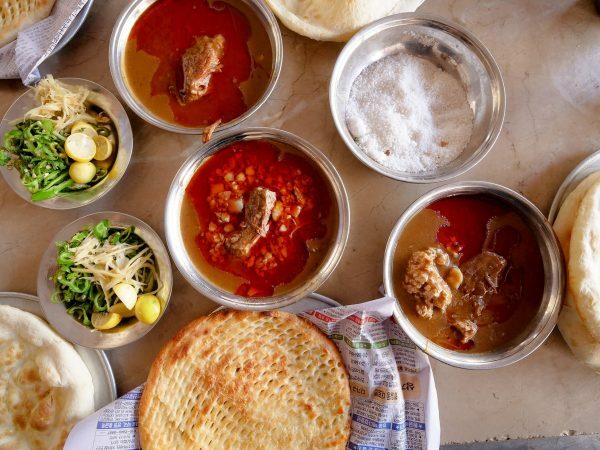 When you’re finished eating brains masala, all around Qissa Khawani Bazaar you’ll find tea stalls that look like they haven’t changed in appearance since the ancient Silk Road trade – and the tea kettles look like they are original too. It’s amazing. When you order, he takes an ancient tea kettle, pours in some water from one of the ancient copper vats, puts the kettle onto the hot plate, and in a matter of seconds it’s boiling. In goes a handful of green tea leaves, followed by a couple pods of cardamom, which he smashes in a mortar. 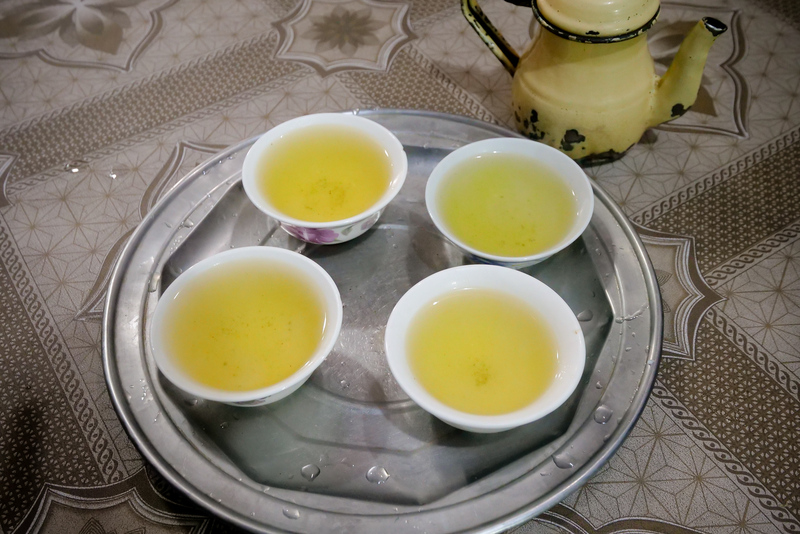 Locals use this method of tea after food to help with digestion, but its also just a delicious hot drink. Wherever the tradition starts, its a lovely way to end a meat-heavy meal here in Peshawar. The cardamom infusion is what really makes Peshawari green tea stand out. 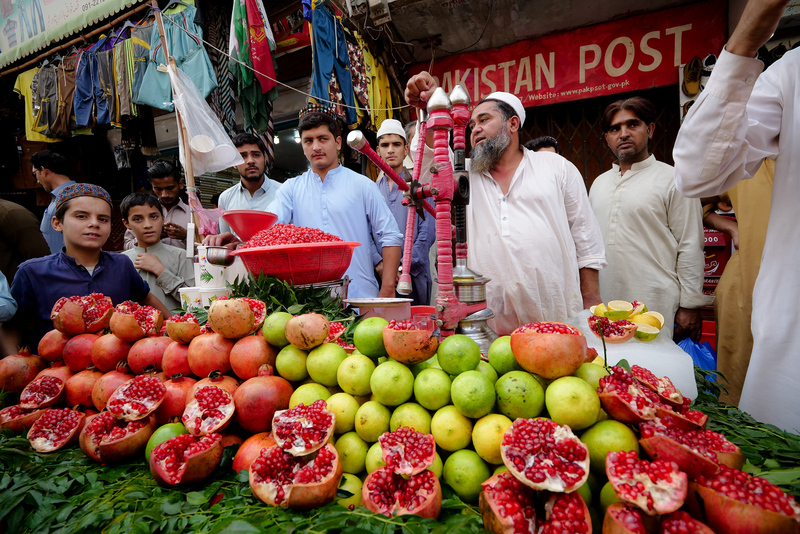 In addition to green tea, one of the most memorable beverages I had in Pakistan was from this very fruit cart, which was like an oasis or colorful beautiful fruit on the side of the street. Again, the stunning cart display, made me cross the street immediately and order a fresh pomegranate juice. They had the pomegranate seeds peeled already, so soon as you order, they toss a couple spoons of the reddest pomegranate seeds you’ve ever seen into the grinder, and out comes the foamiest, frothiest pomegranate juice ever. It literally was one of the best cups of juice I ever remember having. Perfectly sweet and sour, tart and crisp. 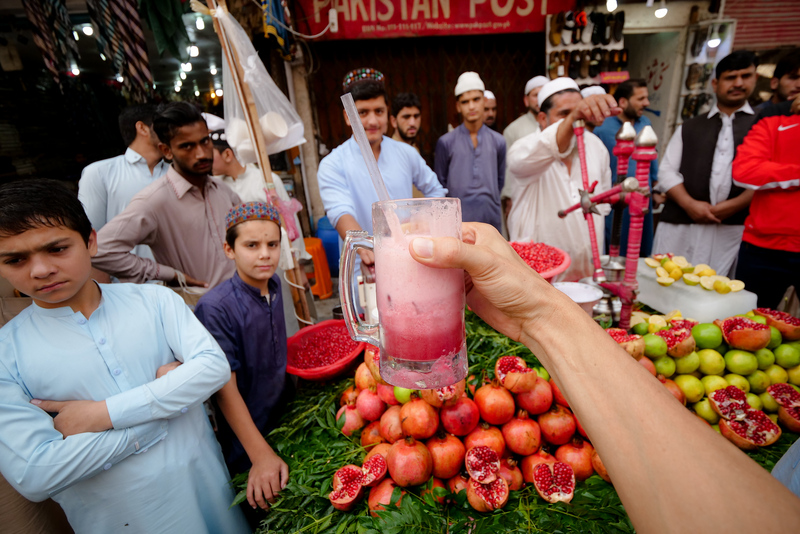 So when you’re in Peshawar, Pakistan, don’t hesitate to order brains masala, and follow that with hot green tea, and finally a glass of fresh-pressed cold pomegranate juice. Price: 90 PKR ($0.72) per plate of brains masala, 20 PKR ($0.16) per round of tea, and 200 PKR ($1.60) per glass of pomegranate juice. The brains masala looks good food but worries about the very high fat content. Oh my gosh! I think no matter how hard I tried, I just can’t do this one. Love this post though, you tell a great story. What a nice food !!! Thank you Vandana, have a great day! What a nice food ! I always see your video at youtube ! I tried Brain Masala Dish on my recent Pakistan Tour, and it gave a perfect traditional taste. The prized ingredient of the dish makes it very delicious, and I must say it will tickle your taste buds for months. This is due to the comfortable-yet-flavorful menu of dishes which give great flavor combinations and unique taste. I am very happy to hear this! Yes, not the most common food Im sure, but I am so happy that you enjoyed it! Take care, and thank you for your continued support of Migrationology! Vishal! Thanks so much, thats a great comment. Take care, and thanks for the support. Hi Mark, I just stumbled across your blog and I’m absolutely fascinated with this. There’s something almost cathartic in the way you describe the food culture, traditionally way of cooking and the daily life of people without any ‘western’ prejudices or any of this typical ‘western’ kind of arrogant, narrowminded attitude towards certain ingredients, that might be somewhat uncommon in Europe or USA. It’s a great find for me. Bookmarking and registering right now. Many thanks and best regards . Hello Saad, thanks for the comments! 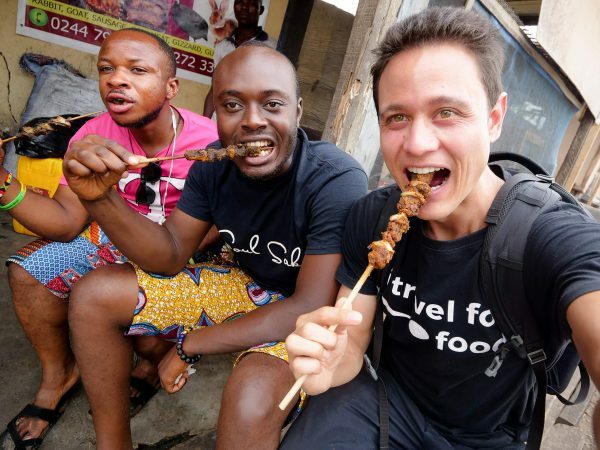 Maybe we will have another chance to visit Pakistan, and of course, have another chance for all the hundreds of foods, and thousands of things left to explore. Take care! U miss to visit Abbattabad,Manshera Balakot side ,the weather there r so cold. What about tarojabba???? Haaan? Isnt it the absolute perfection?!!! Heyyy what about chapli kabab???? @Joel you missed on quite a few delicacies from the KP province but that was because Ali is not from that region and doesn’t have a full grasp on the culture and food of the particular region. It isn’t his fault because even many pukhtoons don’t know about it because our food has never been documented properly. If you ever do get a chance next time you have to try charssadda rice aka ghattay rojay and dump pukht. I would be more than happy to host you. Stay blessed. Love all your videos 🙂 Thank you for visiting Pakistan Joel and Mark! 🙂 I hope you enjoyed a lot and would love to see you soon. Waleed, we enjoyed ourselves to the fullest. Pakistan is amazing, we would love to visit again! Thank you so much for coming to Peshawar Mark. It’s so good to see you wandering in the streets of my home city and enjoying the food. Thanks for all the support Raheela! Peshawar was like the icing on the cake of a wonderful trip. Such a cool city! Have a great day. Thank u sooo much for coming to Peshawar Mark. It’s so good to see you wandering in the streets of my home city and enjoying the food. Is this is tasty ,the brain ,can we could eat it,i never eated a brain . Thank you for the comment, yes it was incredibly tasty, I highly recommend it! 2. How come you never gain any weight?! Hi Horton, thank you so much for the comments! Yes those are very normal questions for all of us, I can’t possibly pick a single favorite food but I would have to say that right now both Mark and I both are frequently still talking and laughing about the Chapli Kebabs in Peshawar. They were just on another level, one of the best single things we could ever imagine tasting… and about the weight, we do gain weight! Just very slowly 🙂 Have a great day! Awesome comments Anna, thank you so much. It is inspiring and motivating to read these words, thanks for sharing them with me. Have a great day! Thanks for all your support. Joel you missed out on the most yummiest delicacy of the KP province, at par or even better than the chappli kebab. I don’t blame Ali because our province food has not been documented properly before and even many pakhtuns themselves don’t know about it. You missed out on Charsadda rice aka ghattay rojay, sohbat/painda depending if you are having it in the north or south of the province and a good old school dump pukht, a whole lamb pit roasted for 5-6 hours. Would love to host you next time you are in Pakistan.